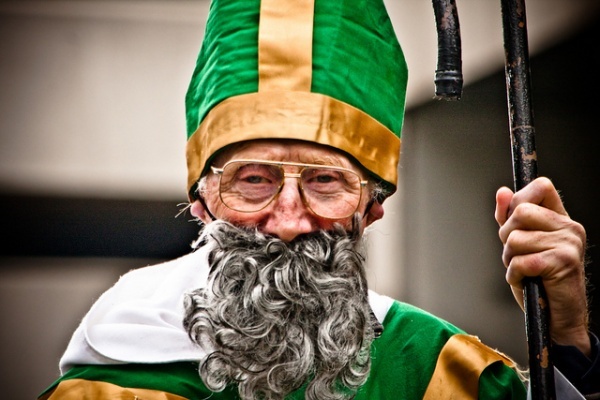 Why the hell do we celebrate St. Patrick’s Day with drunken revelry and partying? The night of debauchery is literally 1700 years in the making, beginning with the plight of a teenage slave and slowly growing to become an Irish (and international) tradition. Born in 385 A.D., the man who would become St. Patrick lived under some very strange circumstances.Â Born with the Roman name Patricus, Patrick lived within a Roman-ruled section of Britain, but, in his mid-teens, he is captured by slavers and sold to owners in Ireland. At some point during his slavery in Ireland, Patrick claimed God visited him in a dream and told him how to escape captivity, a successful plan that took him back to his home in Britain. Upon his return, Patrick devoted his life to the church and became a priest. If one is enslaved in Ireland and subsequently flees, it is rather unlikely that said former slave would ever return. Patrick did just the opposite, returning to the country in his early 50s as a Catholic missionary. Patrick set out to rid the native Irish of polytheism. Various fables claim St. Patrick ran the existing snakes within Ireland into the surrounding waters, but it is more likely that the country of Ireland area never enjoyed the presence of snakes in the first place. The only solid evidence we have of a teaching of St. Patrick supports the use of a three leaf clover to illustrate the Catholic view of the Trinity. Patrick spent the remainder of his life – a little over 3 decades – in Ireland, minister to those in the land in which he was once enslaved. The story of St. Patrick is not without controversy, however, as modern scholars posit that our current view of this history figure is a composite of two individuals working in Ireland at the same time â€“ a cleric named Palladius and the enslaved Patricus. Extremely beloved, a very short battle between Scot-Irish tribes residing in the region Ireland occurred after St. Patrick death for possession of the elderly manâ€™s body. Modern St. Patrickâ€™s day is celebrated on March 17th, the day believed to be ohis death. Although he is one of the most famous â€œsaintsâ€, Patrick never obtained “official” sainthood from a Pope. Public opinion and praise led to attribution of the title within the Anglican, Coptic, Eastern Orthodox, and Roman Catholic churches. March 17th quickly became a â€œfeast dayâ€ on many religious calendars. As early as the 9th century, the day began to be commemorated in Ireland, but only as a minor occasion topped off with a large family meal. St. Patrickâ€™s Day did not begin to become the rambunctious night it currently is until the arrival of European transplants in North America.Â In the dawn of the United States, several political figures and members of the â€œnewâ€ aristocracy celebrated the day in order to retain a connection to their European homeland. This desire to maintain a connection put increased emphasis on March 17th, and expanded the scope of celebration from a family meal to a community-wide celebration. An influx of Irish immigrants into North America during the 18th Century aided the rise of St. Patrick’s day, as well as March 17th’s position on the church calendar near the end of the Lenten season. The Lenten season calls for abstinence from meat and alcohol, and St. Patrickâ€™s Day gives a great excuse to imbibe in liquor and large meals at the end of Lent. A traditional dinner of Irish bacon (typically substituted for corned beef in the United States) and cabbage topped off with whiskey became a popular way to celebrate St. Patrickâ€™s Day amongst Irish immigrants in the mid to late 1800s. As Irish immigrants continued to influence North American society, St. Pattyâ€™s Day became a holiday for all, an event topped off with only wearing articles tinted with green (stemming from St. Patrick’s teachings using the shamrock in Ireland) for the tame and drunken revelry by those with fewer exhibitions. In 2011, Astronaut Catherine Coleman sent a special greeting, including a performance of traditional music, from the International Space Station. Itâ€™s also a great excuse to make Guinness ice cream and pass out on a stranger’s floor. It’s quite bizarre to think that anÂ enslaved teenagerâ€™s struggles in the 5th Century A.D. led to annual night of drunken revelry and parties in space, but I’m sure the original Patricus would be amused. Top image is via Garry Knight/Flickr and is within CC. 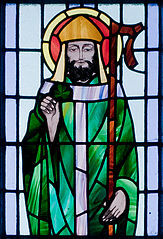 Stained glass image of Saint Patrick is from St. Benin’s Church via Andreas Borchert/CC. 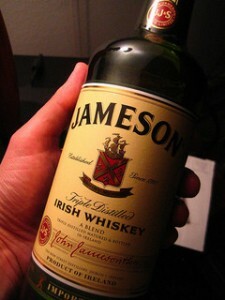 Image of Jameson Irish Whiskey via Rick/Flickr and is also within CC.